/ Will Your Cat Love the Catit Flower Fountain? 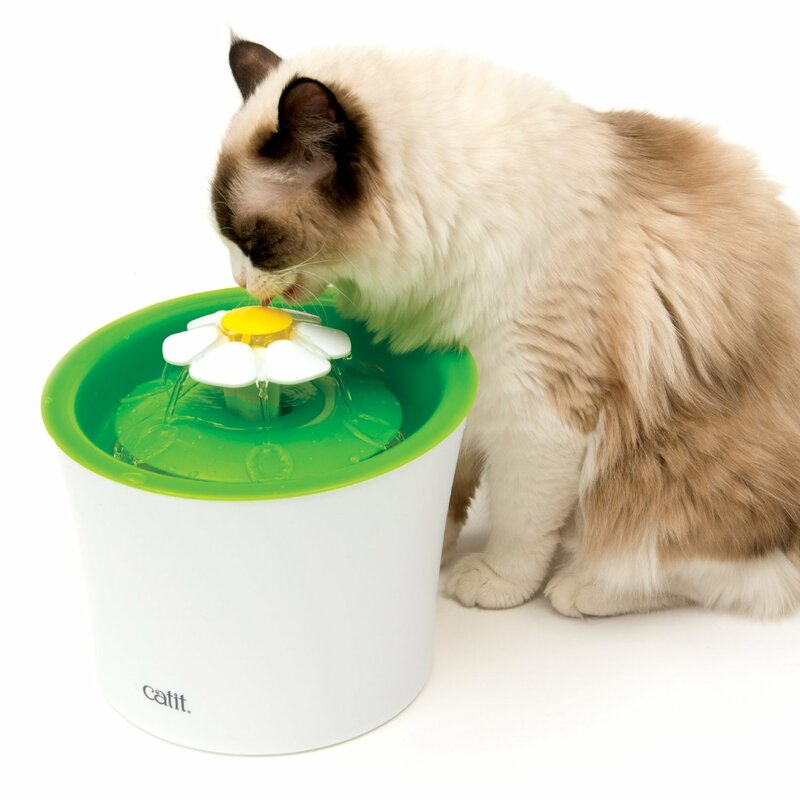 Will Your Cat Love the Catit Flower Fountain? The Catit Flower Fountain is probably one of the most unusual designs for a cat water fountain out there. But, while it looks very pretty and cool does it actually do its job? After all the main purpose of a cat water fountain is to supply clean, fresh water all day long to your pet. A big plus for the CatIt Flower Fountain is that it holds a large 100 fluid oz of water (approx 3 liters). And because it is shaped like a bucket it does have a smaller footprint than previous CatIt water fountains. Which for someone with limited space is pretty great. So What is the CatIt Flower Fountain? Looks wise this water fountain is cute and cool at the same time. 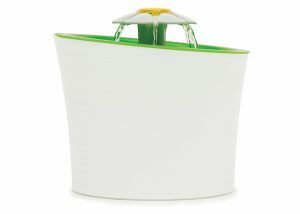 It has an opaque bucket which stores the water. On top of this is a green “water pond” area. The water bubbles out through a hole in this green area from the water bucket below. What makes this water fountain cute is that you can now have a plastic flower placed in the middle of the green water area. This flower then acts as a faucet which means your cat gets to enjoy whatever water flow it wants. No flower and the water flows out over the top of the green water area. Petal of the flower is in the water spout area and the water flows over this and flows into the green lake. This acts like a faucet. Place the bud into the center of the flower. This gives a calmer stream of water. So if you have a cat that loves a bubbling brook kind of water fountain then leave the flower out of the Catit flower fountain. However, if they prefer a faucet type of fountain then just place the petals into the flower fountain. Setting up the Catit Flower Fountain. This is very simple to do. The pump is placed into the bucket area and the special filter is placed under the green base. Fill with water place the green plastic piece in place and then use which ever parts of the flower you require. Then switch on the pump at the mains. Water will then flow up through the output hole and bubbles over the green base. The filter itself is a dual action water softening filter. This purifies and softens hard tap water whilst trapping dirt, cat-hair and other debris. Whilst it is good to have a water fountain that provides clear, fresh water for our cats. We also need something that is easy to maintain and doesn’t break the bank to maintain. I can safely say that the Catit Flower water fountain is very easy to clean. First up the water fountain itself comes apart into four pieces – the bucket area, the clips that hold down the power cord and pump, and then you have the green water base plus any flower pieces. You just remove the pump from the bottom of the bowl and you can clean this part with a toothbrush (an old unused one). The plastic pieces can go in the dishwasher or run them under running water. On a day to day basis, you just need to keep the water topped up. And whilst it is simple to do this as you can pour water into the center output area. It is sometimes difficult to see what the water level is as the bucket is opaque. Therefore you sometimes only know the water has gone lower when the pump starts making more noise. Once every week or so then empty the water and give the filter a rinse. A full clean only needs to be done about every six weeks. At this time it is recommended to change the filter as well and filters are easily purchasable in packs of three. 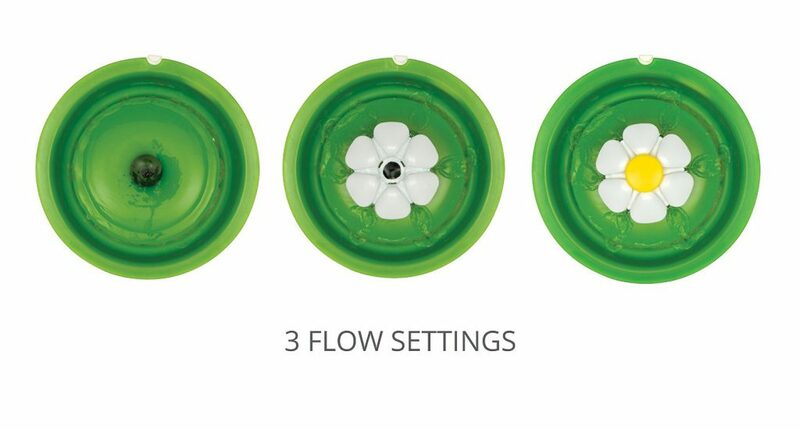 The great idea behind the CatIt flower fountain is that your cat now has a choice of three different flows. Most water fountains are just a faucet or bubbling brook type of fountain. This is very good for fussy cats. One of the things I found pretty good about the flower fountain was that my cat could drink out of it at her own height. Great for cats that are a bit older and a bit stiff. It is a little trickier for kittens to drink from though due to the fountain being 11 inches from the floor. It is quite lightweight so can be knocked over. Cats can remove the flower. As a cool and cute water fountain, I really like the Catit Flower fountain. I like the three flow methods and how they are achieved with the flower. It is a clever piece of design. Dyson actually likes the area where water bubbles out so she needed both flower pieces installed. She has never really taken to water flowing out of a tap – though this could be different for your cats. This is why this is a good purchase for a number of cat households. The different flow methods will attract different cats. The raised bowl though can have its’ pros and cons. This is perfect for older cats who can be a little stiffer and not want to bend down to drink. It is also good for not picking up so much dirt. However, small kittens will have difficulty drinking from this raised bowl – and there are no other bowls to drink from. This raised bowl also leads to the second problem. As this is the only area the water comes out from it does need the pump working in order for the water to appear. Otherwise, the water just remains in the bucket which is pretty inaccessible. Therefore, this is not such a good design if the power goes out. So a backup water bowl would be required. A lot of other water bowls do have a water reservoir which is accessible when the power goes out. Overall though I do think this is a pawsome water fountain. It is great value for the price and great if you have more than one fountain. 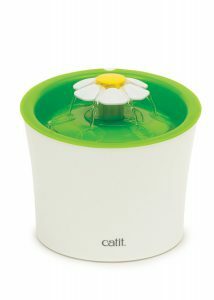 The Catit Flower Fountain is available now from Amazon. Great review and if I had a cat I would get this. Friends of mine have cats and I will share this with them. Do cats like this sort of thing? My cats only ever use fountains. One reason being is that the water is always fresh and oxygenated and not stale. I appreciate your reveiw of this product. I have a cat that loves to put her paws in the water and spilling the water on the floor. Not sure why she likes it but this product can put an end to that. Plus it looks nice. I am surprised that is holds that much water. This looks like a neat product! I don’t have cat anymore but I bet my dog would enjoy this fountain just as much. I may have missed this in your review but does this plug into an outlet or run off batteries? Also, is there any kind of warranty? Thanks! Very cute product. My fiancee and I don’t have a cat, but we do have a female dog that always gets mistaken for a boy dog. I suppose it is partly my fault since I dress her in blues and blacks a lot, but I bet my fiancee would love this fountain. I’ve been curious about products such as these, and I think it would help to get my dog to drink more water more often. Thanks for the great info! I enjoyed very much reading this detailed review of the Catit Drinking Fountain. Whether our cat would like it is another matter as getting cats out of their comfort zone from what they are used to can be a problem at times. Our cat doesn’t seem to be too fussy though and as long as we have a fresh bowl of water outside as well as inside the house for him each day he doesn’t mind. He even drinks out of our swimming pool!! Anyway we may try him out on one of these as a treat for his next birthday. I think my cats would really love this. My boy cat, Shadow has a habit of playing with his water bowl and will actually flip it over. So now I use a heavy glass bowl for his water. He tries to flip it but hasn’t been successful yet. I wonder how heavy this flower fountain is. My worry is that he will flip it over. Any idea?